Also called Saloon Dances, these dances are reminisant of the Spanish colonial period. While they have been assimilated as Honduran dances, they have not lost their traditional essence. Dance classified by the National Office of Folklore as a Colonial type dance that was danced in the village de San Francisco, municipality of San Marcos de Colon, department of Choluteca. Its name derives from the attitude of the dancers who mimic seeing, hearing and saying nothing. The dance comes from the village of San Francisco, department of Chulateca. This dance was researched and documented by Rafael Manzanares Aguilar of the National Office of Folklore. This dance was researched and documented by Wilberto Bonilla Ríos in the city of Comayagua, in October of 1996. The music and steps were informed by Mrs. Patrona Caballos de Gaekel, 98 years old. This dance is danced for many popular festivals such as weddings, baptisms, Independence Day. It was danced by all social classes, especially by young people, since it was a very happy dance of the time and was used to conquer or fall in love with the ladies taking advantage of the most judicious moments. The shoes used when dancing the piece were very shiny patent leather and the dancers took advantage of the movements and steps of these to display them. They used to do the little jumps that are made when performing this dance. The costumes in the era of this dance were for the men costume of Farré (colonial), for the ladies a princess dress remanescent of the 18th and 19th centuries. The music was originally played on piano and violins, later by wind bands, which contributed to more animated parties. The attached music was performed with marimba, accordion and double bass by the musicians of the Cuadro Nacional de Danzas Folklóricas de Honduras. This dance was researched in the city of Comayagua from September 14 to October 26, 1996 by Wilberto Bonilla, Denis Saravia, Alessandra Argueta Ramos and other members of the Cuadro de Danza de la Escuela Normal Centro América de Comayagua (ENCA). The dance was informed by the music teacher Petroliza Cevallos de Gaekel, daughter of the first Honduran folklorist (Fernando P. Cevallos, 1870-1965), who at age 90 was affectionately called Doña Toñita. She was born on April 17, 1906. Doña Toñita tells us that this dance was performed by adults and high society. It was performed at all such social parties in the city. When the party was getting slow, then people started saying "the dance the cuadrilladas," and the couples who had learned the dance, with its specific figures, would move onto the dance floor. It was danced for the last time in the year of 1918 by older people, among them were her parents, at a social party. Doña Toñita later learned the dance when she was in school, because the teacher Matilde de Boquín, rehearsed them to perform for an evening on September 14. Later it was danced for coronations of the queen of the city, so it acquired the name of "Cuadrillas de la Reina," because it was danced immediately after the coronation in honor of the queen. She also told us that this dance was brought from Spain and later accepted by the people of Honduras, so it is classified as of colonial origin. The dress worn by the women for the dance was called "old lady," and the one worn by the gentlemen "suit of frac." Or simply suit. This dance is originally from the village of El Espinal, municipality of Pespire, Department of Choluteca. In this dance the boys offer their partners a flower of Reseda. If she accepts it, it is placed in her hair, and the couple join the dance, otherwise not. The research was informed by Doña María Vda. De Ramos in Pespire and documented by Carlos Gómez and Rubén Ruiz, from the National Office of Folklore. Jarabe dances derived in colonial times in central and southern Mexico from popular Spanish music and dances such as seguidillas and fandangos. The dance form was also influenced by native Mexican couple dances imitating the courtship of doves. 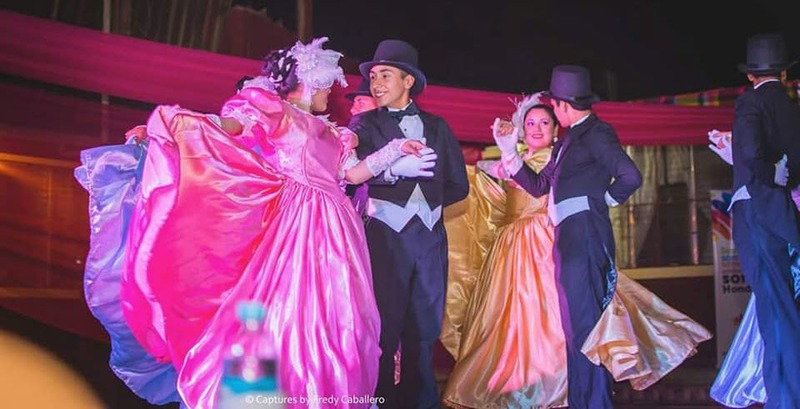 Typically, jarabe dances are flirtatious dances that represent courtship of a man and a woman, with the woman first rejecting the man’s advances, then eventually accepting him. Jarabe translates to syrup or honey, in other words "sweet love". During the colonial period, the church sometimes found jarabe dances too risque and imposed bans against them, which obviously made them more popular among young people. The most widely known jarabe dance is the Jarabe Tapatío, commonly referred to as the Mexican hat dance. In this popular Honduran dance, the roles are reversed. The men are tired from working all day, so they don't want to dance. The women invite the men to dance, and when they refuse the women pull them from their seats. The women then take the initiative and dance flirtingly around their partners until they convince the men to dance. The men eventually end up pleasing their partners. The dance consists of a variety of steps, the most complicated of these are reminescent of Mexican dance steps. Yoreño in the name refers to the Honduran department of Yoro, where the dance originated. This dance was informed by Mr. Miguel Valdez Urbina in the municipality of Victoria in the department of Yoro and researched and documented by the Honduran folklorist Rafael Manzanares Aguilar. This dance is classified by the National Office of Folklore as a colonial dance. This dance originates from the city of Choluteca in the department of Choluteca. It was researched by the folklorist Jose Rafael Flores Bonilla. This dance was originally from the city of Comayagua, compiled by Professor David Adolfo Flores and Luis Gustavo Castellón in collaboration with Estela Gaekel de Ruiz and informed by Petrona Cevallos Gaekel. This dance was danced in the regal halls of Las Casas in the city of Comayagua, by the visit of the governor of Los Leones in the year of 1958 (danced from 4 to 6 couples). It was danced in colonial times, the ladies and ladies brilliantly dressed in their cute costumes of the time and the gentlemen in their elegant Frak costumes, make the entrance to the room. The first part is the entrance of the couples who parade one after the other, enter arm in arm gentlemen and young ladies to the field of cheerful march to be placed in the spacious Hall in their respective places. Compiled by Jose Rafael Flores Bonilla. Originally from Choluteca, Choluteca. This dance was originally a ballroom dance of the royal court of the Polish nobility that eventually became a dance for the popular classes. In the rural tradition they often danced together in order: mazur (medium fast), kujawiak (slow) and oberek (fast). The difference between these dances is based on expression and speed. Written in ternary compass (3/4, 3/8), the dance is characterized by its accents in the 2nd and 3rd times, in contrast to the waltz. It is also very similar to the minuet (of French origin, the most famous dance during the eighteenth century) in terms of its structure and its moderate movement. This dance was danced at the beginning of the 20th century in the dance halls of the municipality of Tegucigalpa. The dance was informed by Rafael Manzanares Aguilar of the National Office of Folklore. This dance called Pereke was danced the south of the country a high society parties. The dance requires agility and a capability to improvise. The National Office Folklore, has classified as a dance Regia or Colonial. The dance was informed by the Eliseo Pérez Cadalso. and was compiled by the Rafael Manzanares Aguilar. Rafael Manzanares also called the dance El Pereke Zapateado for the form of dance, which is characteristic of southern Honduras. The dance has creole influences and originated in the village of Santa Elena municipality of El Triunfo, department of Choluteca. More detailed choreography was added more recently after additional research by Eliseo Pérez Cadalso. A creole dance considered colonial that was danced the inhabitants of Los Cerros La Picota, San Francisco, Los Encuentros and El Trapiche, who came down to participate in the patronal fair in honor of San Antonio in the region of Pavana, jurisdiction of Choluteca, department of Choluteca. On the occasion of the fair, the dancers wore their best clothes. Men included spurs and a machete with their garb, and they would hurry to choose their partner for the dance. The girls wore dresses of flutters and a handkerchief on their heads, as a sign that at that time most of the families had a small herd of cattle as their main means of subsistence. The dance was informed by Rosindo Ramírez and compiled by Auxiliadora Narváez and Sandra de Núñez. This Regia or Colonial dance was danced in dance halls that was danced during the patronal fair in the village of San Juan Pautista in the municipality of Perspire in the department of Choluteca. In the plaza of the village of San Juan was doña Arcadia Ramírez, who sold cigars of the brand "La Vieja". When When doña Arcadia saw Ignacio Perdomo, who was called Nacho, she yelled at him, "Hey Nacho, take me to the fair of Sanjuaneada and I'll give you a bit of cigars! And from there originated the name of the dance. Dance Regia or Colonial from the village La Enea, municipality of Morolica, Department of Choluteca. Informed by Don Víctor Moncada and Doña Reymunda Martínez de Moncada, both from the village of La Enea. As the girl tried to dance, her sorrow was so great that she could not control herself and began to weep in the middle of the room. The boy with whom she was dancing, seeing the tears running down her cheeks, took a white handkerchief and gave it to to dry her face. From then on, the name of the dance became Polka al Son de la Llorona ("Polka to the sound of the Weeping Girl"). Researched and documented in the village La Enea by Prof. Oscar Armando Guevara Molina. This dance was danced in the atrium of the cathedral of the city of Comayagua, in honor of General Xatruch and the soldiers who returned victorious after bringing down the filibuster William Walker, according to references of the the teacher Pompilio Ortega. The dance compiled by the National Office of Folklore in the City of Comayagua.